This sonnet by George Meredith (UK, 1828-1909) is mythic. On a starr’d night Prince Lucifer uprose. Where sinners hugg’d their spectre of repose. Now the black planet shadow’d Arctic snows. Meredith gives us an epic image of the dark angel so huge that he passes from Africa to the Arctic in a single line of verse, like a dark planet. 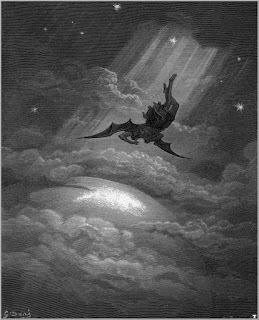 The image of Lucifer’s shadow sweeping across the globe is paired with the mention of sleeping sinners, so that I imagine unconscious people turning uneasily as he passes without knowing why. The personification of Lucifer with scars that prick at the reminder of his past choices and defeat is pure mythology, akin to images of Greek or Norse gods, with human emotions at epic scale. Another interesting image is “the stars, which are the brain of heaven.” I’m not even sure exactly what it means, but it suggests all sorts of interesting possibilities. Yes, there is a certain theology embedded in this poem, but I don’t think Meredith was trying to propound theology. As I said, I think this is about storytelling: a narrative that points at truths not by stating moral laws or philosophies but by illustrating a vignette that fires the imagination with its fantastical images.